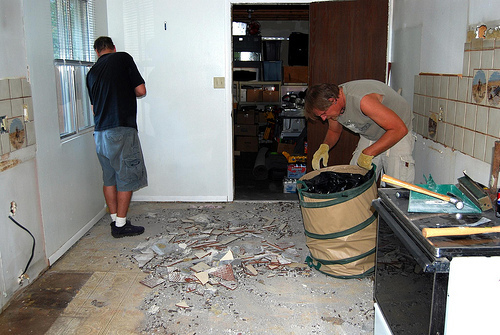 Reining in the mess in your home with a few simple guidelines. De-cluttering a home does not necessarily mean that you will be called upon to lose your prized possessions. Rather than simply being about getting rid of stuff, the process involves making your home more efficient so that finding the things you want will be made easier. Among the factors that may scare those who have cluttered homes and may cause them to procrastinate when facing the task of organization, are the decisions that have to be made. De-cluttering is primarily about being decisive. What do we keep? What gets tossed? The question of whether or not something is essential changes with each item. People often fear getting rid of something and then not having it when they need it. The goal of Knack Organizing Your Home: Decluttering Solutions and Storage Ideas is to help the reader develop the skills for making these decisions. Make your kitchen unique without hiring a designer. The kitchen is the center of most homes, it is one of those areas where people tend to commune, and because of that a homeowner will want to make it as warm and friendly as possible. Decoration for a kitchen is as important as it is for the rest of the home. What many homeowners do not know is that they can redesign their kitchens without the help of an interior designer, and on a budget. All they need is a little guidance and motivation, which is provided by Do It Yourself Kitchens: Stunning Spaces on a Shoestring Budget by Better Homes & Gardens.